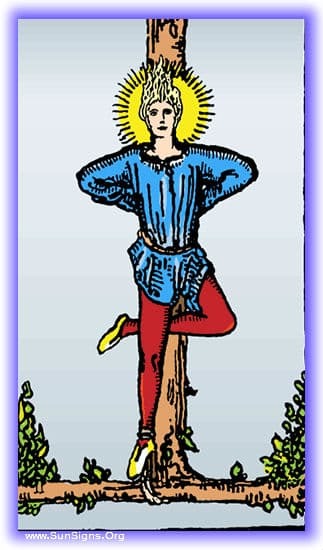 This tarot meditation of the Hanged Man reversed card will be on the dangers of hidden action and deception, both from the position of the actor and those being acted upon. Place a black cloth before you with a black candle at it’s top, with the Hanged Man card placed before you inverted. As you sink into the meditation, feel the air of mystery, suspicion, and duplicity come over you. You come into the meditation in a room of indeterminate size. It is almost entirely a velvet dark, with pockets of light where people are performing various actions, but all of them eye the dark suspiciously. You know you must speak to each of these people, but you also know the dark is dangerous. Somewhere in your heart you know that there are people in the dark enacting secret plans. So you begin to enact one of your own, why, rather than going through the dark, you can get the people you want to talk to, to come to you. You begin making quiet deals. You whisper to one person in the intent of getting them to talk to the others to get who you wish to speak to, to come to you. It becomes difficult as time goes on, you have to keep all the cards in balance, and people begin to suspect. You then start running into others plans, and having to make deals with them. All you want to do is speak to this one particular person, to get this one particular thing, but you do not feel you can go directly. In time you have to make concessions, you have to make deals, and you are no longer sure whether you are the manipulator, or the manipulated. Everything becomes suspect, you no longer trust any of these strange people in their pockets of light, and in some ways are no longer trusting your own words or decisions. After all, what if you’re being manipulated, would you even know? Ultimately the game continues, no one goes anywhere, and everyone is attempting to pull strings on everyone else, and all remains in tangled stasis. Eventually you realize the only way to win this game, is not to play. So you slowly pull yourself out of the tarot meditation, removing yourself from this tangled mess. Think carefully on the meditation, on the life you live, and the behaviors you engage in. Are you attempting to manipulate others? Are you trying to pull strings? Write in your journal your observations on this situation and your place in it, and consider the power of openness and honesty. Playing your game above-board is the best way to go more often than not.